Cardi B and Offset appear to be calling it quits. On Tuesday evening, the "Bodak Yellow" rapper took to Instagram with a big announcement for her fans. 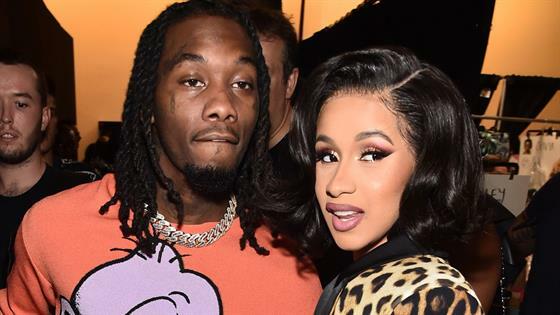 "So everybody been bugging me and everything and you know, I've been trying to work things out with my baby father for a hot minute now and we're really good friends and you know we're really good business partners," Cardi B explained in her video. "He's always somebody that I run to to talk to and we got a lot of love for each other but things just haven't been working out between us for a long time and it's nobody's fault." She continued, "I guess we grew out of love, but we're not together anymore. I don't know. It might take time to get a divorce and I'm gonna always have a lot of love for him because he is my daughter's father and yah." Cardi B captioned the post, "There you go…peace and love." Offset would comment by writing "Y'all won." The Hollywood couple, who are proud parents to a four-month-old daughter named Kulture, secretly got married in September 2017 with a frills-free ceremony. In fact, Cardi B didn't confirm the wedding until June 2018. "Our relationship was so new breaking up and making up and we had a lot of growing to do but we was so in love we didn't want to lose each other," she shared on Twitter at the time. "We found someone to marry us, and she did, just the two of us and my cousin. I said I do, with no dress, no makeup and no ring!" Today's breakup may come as a surprise to fans. After all, the pair attended 102.7 KIISFM's Jingle Ball concert last weekend at the Forum in Inglewood, Calif., where they had a PDA-filled performance. "Thank you husband. He's so fine," she told the crowd after singing "Ric Flair Drip" together. "That's my baby daddy yo." Shortly after Cardi B's announcement, Offset revealed on Instagram Stories that he will be "dropping a song tomo." Perhaps fans will learn more about what led to the breakup.